Realwheels launches Comedy on Wheels! You are here: Home / The Spin / Realwheels launches Comedy on Wheels! Realwheels invites you to the LAUNCH of Comedy on Wheels, a community collaboration through which issues of burning importance to YOU will be explored though a comic lens. Comedian Ryan Lachance will kick off the first performance workshop with a keynote presentation that’ll get you thinking and giggling! Ryan Lachance has quad-spastic cererbral palsy and is confined to a wheelchair. 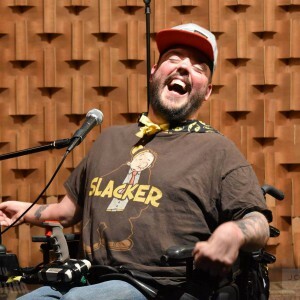 He draws comedic inspiration from stories about growing up with a disability and the unique perspective on the world that it gives him. His peers have deemed him “the peoples comic” due to the regularity of performing while sitting in the audience. This dynamic has strengthened his conversational style and easy rapport with people. A career highlight so far for him was being honoured to perform for Billy Connelly and Robin Williams, two of his favourite comedians. Ryan Lachance is both honest and hilarious and tells it as it is. Comedy on Wheels will be facilitated by international comedy expert David Granirer and led by Realwheels’ managing artistic director Rena Cohen. Participants (YOU!) will receive coaching and training in storytelling, comedy, and performance from a variety of stellar guest artists. The project culminates in a celebration of everyone’s stories in a fully-staged theatrical production in May 2017. Following the keynote presentation (and a little mingling with friends), David Granirer will lead the first training workshop. Come prepared to learn, laugh and push your comedic boundaries! 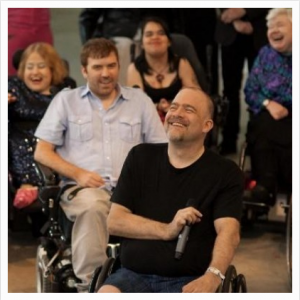 No experience necessary to participate – Comedy On Wheels is for everyone! Let’s dissolve barriers through shared laughter! Bring your friends!